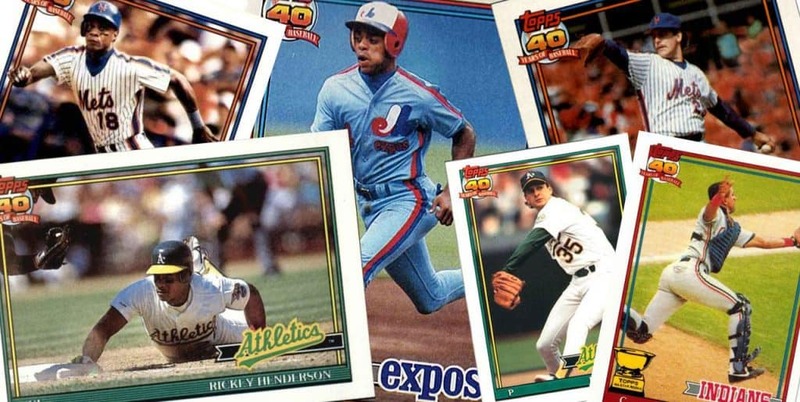 1991 Topps cards — representing the 1990 season — of the players I predicted for the top awards as a 13-year-old. The benefit of being a low-level packrat (it’s not like you can’t walk through rooms in my house or the basement, which is my Dan Cave) is that I’ll occasionally come across things from my childhood that spark a memory or otherwise bring me back to a particular time in my life. The 1990 notation was written the other day, so that I won’t forget the year in the future. But the rest of that is my teenage handwriting predicting how the 1990 baseball season would play out once my 14th birthday passed and the pennant races played out in September. But there’s no follow-up. The only other thing written on the page is a math problem (34 = 9 + x2), with the answer — or at least a partial one — below it (25 = x2). Then the notebook moves on to lists of mix tapes to make and song lyrics to write out, because those were other things I was into in the summer before starting high school. So how did my predictions turn out? Thankfully, the internet has the answers. A quick look at the entire list shows my Mets bias. I’ll get into the team predictions and standings later, but let’s look at New York’s right fielder as of July 28, 1990. That date was a Saturday, and the Mets lost a day game to the Cardinals, 1-0. I may have written out this list while watching that game, but without the internet and instantaneous updating of stats and standings, the most up-to-the-minute information I would’ve had would be through games of July 27, 1990, so all stats and standings I’ll refer to in this post will be through that date. On July 28, Strawberry was batting .287/.380/.545 (.925 OPS, not that we knew what that was or meant in 1990) with 25 home runs and 66 RBIs in 94 of the Mets’ 96 games, leaving a potential 66 more games for him to play. At that rate, he was on pace for 43 home runs and 111 RBIs; he finished with 37 homers and 108 RBIs in 152 games (he played 58 of the remaining 66), with his rate stats sliding to .277/.361/.518 (.879). At that time, Strawberry wasn’t a bad pick for NL MVP. He was coming off an appearance in the All-Star game, and then went on to win an NL Silver Slugger Award. But he finished third to the Pirates’ Barry Bonds and Bobby Bonilla in the NL MVP vote. At least he was on the medal stand — or, had MLB Network existed back then, he would’ve been on the hour-long announcement special. The Mets’ big trade deadline acquisition of 1989 was in his first full season at Shea Stadium and had just won on July 27. He was 14-5 with a 2.36 ERA and had also appeared in the recent All-Star Game at Wrigley Field (which I recall — and noted in this same notebook — watching from my mom’s uncle’s house in Thousand Oaks, where we were staying). Viola wasn’t a big strikeout pitcher — 107 in 149 innings at that point in the season — but I’m not sure I would’ve noticed that. It would’ve been in my mind that he’d won the AL Cy Young Award back in 1988. But Viola, too, regressed the rest of the way, finishing the season on a 6-7 run with a still-respectable 3.13 ERA for final figures of 20-12, 2.67. Like Strawberry, Viola would’ve made it on the MLB Network special announcing the Cy Young Award. He finished third to the Pirates’ Doug Drabek and the Dodgers’ Ramon Martinez. I’m not sure what it was that drew me to DeShields. This was still a time of high stolen-base totals, and one of the best of the late ’80s, Vince Coleman, was a Met at this time (and hadn’t yet set off any firecrackers near fans). I liked small guys who could run, which is how I saw myself as well, because I certainly wasn’t going to be a slugger. At the time of my notes, DeShields was batting .294/.389/.404 with 28 stolen bases in 72 games. The Expos had played 100 games at that point, leaving 62 more, so at that pace, DeShields was eyeing 45 swipes that season. He finished with 42. It wasn’t enough. David Justice took 23 of the 24 first-place votes to beat DeShields handily in the NL ROY race. So far, I’m 0-for-3 on the major individual awards, but at least I’ve been in the money for all three (if this were horse racing). Oakland was a juggernaut at this time, coming off two World Series appearances and defending their title in the ’90 season. Henderson was leading the way from the top of the order and had started the All-Star Game as the AL left fielder. Through 99 team games, Rickey had appeared in 87, batting .332/.437/.585 (1.022) with 18 homers, 75 runs, 39 RBIs and 45 stolen bases. That put him on pace for 29 home runs, 122 runs, 64 RBIs and 74 steals. His final line: .325/.439/.577 (1.106), 28 HR, 119 runs, 61 RBIs and 65 SB. Other than the stolen bases, he pretty much kept up his performance through the final two months of the season; there was no drop-off here. As a result, Henderson edged out Cecil Fielder — who became MLB’s first to reach 50 homers in 13 years — for the AL MVP, 317 points to 286. Henderson took 14 first-place votes, Fielder got 10, and Roger Clemens (3) and Dennis Eckersley (1) got the rest. Welch was pitching in Minnesota on July 28, 1990 (he would lose, giving up seven runs in two innings), but heading into that game, he was 16-3 with a 2.67 ERA and had been the AL starting pitcher in the All-Star Game. I don’t think I needed to look past the 16-3 record to make this prediction (remember, this is 1990, and wins still mattered — a lot — especially to a 13-year-old kid). The rest of the way (including that July 28 loss), Welch went 11-3, though his ERA rose to settle at 2.95. Didn’t matter. His 27-6 record — the first 25-game winner since Steve Stone in 1980 — got him 15 first-place votes and a 107-77 point margin to win the Cy Young over Clemens. Despite playing in one game in 1988 and seven in ’89 with the Padres, Alomar still had rookie status after being sent to Cleveland (along with Carlos Baerga and Chris James) for Joe Carter. At this point of the season, Alomar was hitting .285/.325/.392 with four homers and 38 RBIs — not eye-popping numbers, but it had been enough to get him the starting nod as the AL catcher in the All-Star Game. So the fans knew who he was — meaning I probably knew who he was — and the ROY talk may have already started. I could’ve been following that. It turned out to be the right call, because Alomar won the award unanimously, easily beating the Yankees’ Kevin Maas, who played in just 79 games but hit 21 home runs. I redeemed myself with these awards, hitting all three in the American League to finish at .500. At the time of my jotting, the Mets held a one-game lead over the Pirates in the NL East, and clearly I hoped and rooted for them to hold on. The Reds were 7 1/2 up on the Giants in the NL West, so it looks like I was calling for quite a comeback by San Francisco. The Blue Jays led the Red Sox by a game in the AL East, and the A’s were 2 1/2 up on the White Sox in the AL West. By the time the dust settled, Pittsburgh beat out my Mets by four games; Cincinnati went wire-to-wire to win the West over Los Angeles by five games (San Francisco was six back); Boston overcame Toronto to take the East by two games and Oakland ran away with the West by nine games over Chicago. My tally is 1-for-4 there, though I did nail the margin of victory in the AL East, so that’s something? 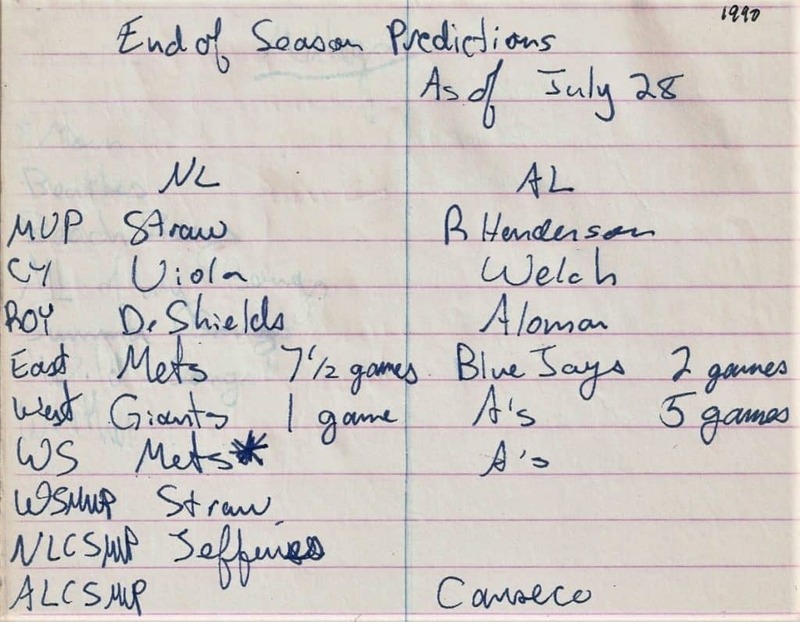 So out of 15 predictions made on July 28, 1990, I hit on five of them. I’ll take a .333 average for a 13-year-old baseball fan, a cast on his left forearm from a spring baseball injury, scribbling out his thoughts on a summer afternoon.